Booker goes on a walking tour through Tribeca, checking out vintage mural ads! To connect with Frank H. Jump for a Fading Ads tour in NYC, contact him directly at frankjump@fadingad.com. 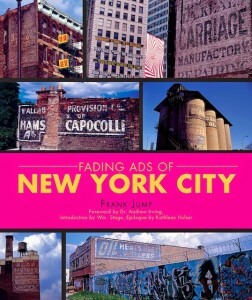 To find out more about Fading Ads in NYC and to purchase Frank’s book on the subject, visit Frank’s WEBSITE. Also, check out UP THERE – a fantastic short film which reveals the dying art of large-scale hand painted advertising, and shows the work of painters who are committed to carry on the tradition. Up There was directed by Malcolm Murray and features Colossal Media/Sky High Murals.